Set in the post apocalyptic world of Panem, the Hunger Games is a based on the book of the same name by Suzanne Collins. Panem is split into 12 Districts and ruled by the people of the Capitol. Every year, each District sends two Tributes: a young man and woman, to the Capitol where they take part in the Hunger Games, a fight to the death battle broadcast as a reality TV show. The movie follows Katniss Everdeen (Jennifer Lawrence) from District 12 who lives with her mother and younger sister Primrose (Willow Shields) and survives by going hunting with her friend, Gale Hawthorne (Liam Hemsworth). All that ends when she volunteers to take her sister's place as Tribute when her name is picked and is whisked away to the Capitol with her fellow Tribute, Peeta Mellark (Josh Hutcherson). Pitted against opponents who have been training all their lives for the Games, Katniss will have to use all her skills and wits to show the world she has what it takes to survive the 74th Hunger Games. I was lucky enough to see the Hunger Games yesterday courtesy of Toshiba Canada and I was super excited! 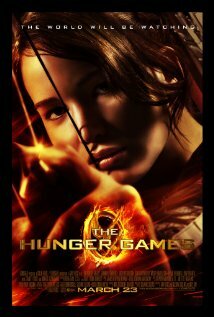 The Hunger Games movie is one of the most widely anticipated movies of this year and it certainly lives up to the hype. The film stays very faithful to the book but there are some changes. Some minor characters and scenes were cut (you won't see Haymitch (Woody Harrelson) fall off the stage unfortunately) and other scenes not in the book were added in like scenes that take you away from Katniss' point of view. You get to see the Games' control centre which was very cool and futuristic! And when Katniss and Peeta came out on their chariot in flames. AH. It gave me goosebumps! The actors really shined in their roles. Jennifer Lawrence especially, played a wonderfully strong Katniss. One thing I loved about the book was that Katniss was this strong, intelligent and independent character and going into the movie, I wasn't sure if Jennifer Lawrence would live up to the expectation. All my fears were dispelled as I watch her. She was quite frankly suited for the role. She portrayed Katniss exactly how I imagined. I felt every emotion that she was going through and I teared up at the scene with Rue (Amandla Stenberg) from District 11. Unavoidably, there is a fair bit of violence and brutality in the film, but the director does not linger on the scenes. My favourite scenes were (without giving anything away), the chariot ride, the private skill demonstration and the reaction scene just after that, and Katniss' lullaby scene with Rue. Another thing that amazed me were the costumes of the people of the Capitol - from the immaculately groomed head Gamemaker, Seneca Crane (Wes Bentley), to the elaborate dresses of Effie Trinket (Elizabeth Banks). The costume and make up artists did an awesome job of creating the 'oddness' of the Capitol in contrast with the Districts even if it was just simple things like some oddly shaped facial hair! Word of caution: they really like to use hand held cameras throughout the film. Though it gave a gritty and real feel to the movie, I thought it was used a little too often and can also make a sensitive person slightly ill especially if sitting too close to the front. If you are one of those people then make sure you sit in the back. But other than that, I see no fault in the visual style. Close up shots of the Tributes faces, really draw you in to the level of emotion you can see. GO SEE IT. The world will be watching and if you are not, you are missing out. The Hunger Games opens in theatres Friday, March 23, 2012. I'm already really looking forward to the next one!